The landmark women's reservation bill was tabled in the Rajya Sabha by Law Minister Veerappa Moily amidst ruckus by Opposition parties. Both houses of Parliament were adjourned following an uproar over reservations for women and minorities. The Rajya Sabha was adjourned for a third time when Opposition members disrupted the tabling of the bill by snatching the bill from the Speaker's hand and tearing it. The Lok Sabha was adjourned earlier following protests by the Samajwadi Party, Bahujan Samaj Party and Rashtriya Janata Dal against the Women's Reservation Bill. The SP and RJD have also withdrawn their support to the UPA government. Earlier in the day in the Rajya Sabha, Samajwadi Party members demanded that question hour be suspended to discuss, ahead of the women's reservation bill, the Ranganath Mishra report that has recommended quota for Dalit Muslims and Christians. In the Lok Sabha, SP chief Mulayam Singh Yadav and RJD president Lalu Prasad joined their party MPs in raising slogans as the speaker tried to continue the question hour amid the din. Some SP and BSP MPs tried to disrupt the proceedings by gathering near the speaker's podium. The MPs from the three parties demanded that the bill should ensure a 'quota within the quota' for women from backward classes. At one stage, Mulayam Singh had a verbal spat with Finance Minister Pranab Mukherjee, the leader of the house. A desperate Mukherjee appealed to Mulayam Yadav with folded hands to end the disruption.Janata Dal-United (JD-U) leader Sharad Yadav, one of the bitterest critics of the bill, was not present in the house. Parliamentary Affairs Minister Pawan Kumar Bansal and his deputy V Narayanasamy also tried to pacify Mulayam Singh and Lalu Prasad but failed. Unable to bring peace, the speaker adjourned the house at 11.20 am. The protests started soon after the speaker welcomed special guests from the Croatian parliament to watch the house proceedings from a special box and made a reference to the international women's day Monday. In the Rajya Sabha, Chairman Hamid Ansari read out a message on the international Women's Day saying that among others 'women have to be included in the decision making process' when the house assembled at 11 am. 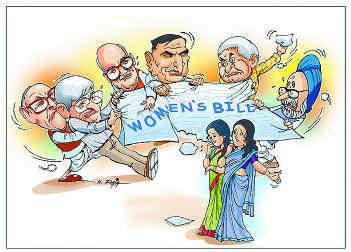 As soon as he finished, Kamal Akhtar and other SP members were on their feet demanding that the report of the National Commission for Religious and Linguistic Minorities headed by Justice (retd) Ranganath Misra be discussed ahead of the women's reservation bill that is scheduled to be taken for consideration and passing later in the day. Ansari ruled it out on the ground that no notice had been served for this. As a handful of SP members advanced to towards the chairman's podium, Ansari adjourned the house. The Women's Reservation Bill will provide 33 per cent reservation of women in Parliament and the State Assemblies. Supporting the Bill, the Congress and the BJP issued whips to their members to remain present in the House to support the Bill. The Left and allies of both the ruling and opposition like NCP, TDP, DMK, AIADMK, Akali Dal, BJD and National Conference have pledged support to the bill. The Rashtriya Janata Dal (RJD), the Samajwadi Party (SP) and the Bahujan Samaj Party have decided to oppose the bill in its present form. Parliamentary Affairs Minister P K Bansal had appealed to all political parties to support the bill, which has been waiting for passage into law for more than a decade.